The first batch of sleeves printed have a false 'sticker' (it is actually printed as part of the sleeve design) stating that the track is called "Anokomeda". This is a typo. All subsequent runs in 1992 (and the repress in 2006) have the amended spelling of "Andromeda". The majority even of the original 1992 pressings have the correct spelling so the sleeve with Anokomeda is therefore actually quite rare. Some issues have the gold R&S sleeve, while some have the silver sleeve. 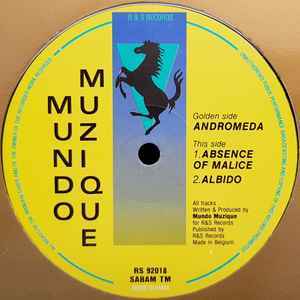 Probably my favourite release on R & S. Mundo Muzique was a visionary. This is an excellent track to sit at home and chill out to, as it has some very sweet synth lines, however it also is pretty upbeat and played in the right set could keep you dancing to the wee small hours of the morning. It would make me a very happy man indeed if Mundo Muzique would release something again to keep us all entertained. With R & S on the go again lets hope Renaat can persuade him to come out of retirement! This is a tune that was taken from the Brooklyn Beats EP that came out on Eazy Street and then R&S. They don't make them like this anymore. Whatever happened to Mundo Muzique?